The global social movement that has arisen in response to the threat of carbon-induced climate change is a very complex and amorphous movement that operates simultaneously at a global as well as at an intensely local level. 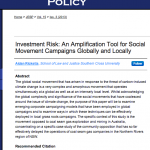 Whilst acknowledging the global complexity and significance of the social movements that have coalesced around the issue of climate change, the purpose of this paper will be to examine emerging corporate campaigning models that have been employed in global campaigns and to examine ways in which these techniques can be effectively deployed in local grass roots campaigns. The specific context of this study is the movement opposed to coal seam gas exploration and mining in Australia, concentrating on a specific case study of the community opposition that has so far effectively delayed the operations of coal seam gas companies in the Northern Rivers region of NSW. 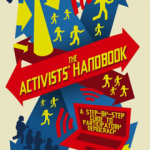 ‘The Activists’ Handbook’ is a powerful guide to grassroots activism. 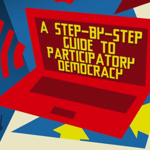 A priceless resource for everyone ready to make a difference, environmental activist Aidan Ricketts offers a step-by-step handbook for citizens eager to start or get involved in grass-roots movements and beyond. Ricketts, A 2009, ‘Corporate claims to fundamental rights: life liberty and immunity to commercial regulation’, Journal of South Pacific Law, vol. 13, no. 2. In this paper the author reflects upon the challenges of teaching, and more importantly the challenges that students face attempting to learn about, constitutional law within the context of recent political upheavals in Fiji. Ricketts, A 2009, ‘Teaching constitutional law to Fiji students’, Journal of Australian Law Teachers Association, vol. 2, no. 1&2, pp. 207-216. Common law principles underpinning corporate criminal responsibility for death by corporate negligence. Ricketts, A & Avolio, H 2009, ‘Corporate liability for manslaughter: the need for further reform’, Southern Cross University Law Review, vol. 13., pp. 56-86. The first act of imagination required of any social change activist is the vision of a better world. The next challenge is to imagine ways to convey this vision to others. In its broadest sense, political theatre is the act of conveying this imagined better world to the everyday onlooker. Understood in this way, theatre is not just a technique that ‘may’ be used in protests but is indispensable. Ricketts, A 2006, ‘Theatre of protest: the magnifying effects of theatre in direct action’, Journal of Australian Studies, vol. 89, pp. 75-87. Ricketts, A 2006, ‘Threshold concepts in legal education’, Directions: Journal of Educational Studies, vol. 26, no. 2, pp. 2-12. The ideological chasm between environmentalism and a profit driven corporate agenda at times seems insurmountable. Bielefeld, S; Higginson, S; Jackson, J & Ricketts, A 2005, ‘Directors duties to the company and minority shareholder environmental activism’, Company and Securities Law Journal, vol. 23, no. 1, pp. 28-50. Ricketts, A 2004, ‘Police powers in the premier state, or the premiers police state’, Southern Cross University Law Review, vol. 8.